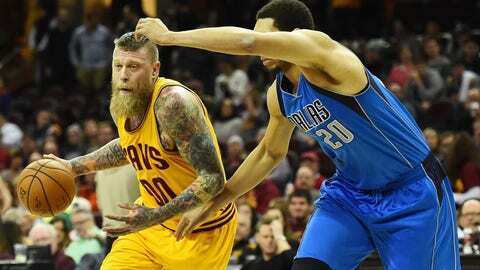 The Cleveland Cavaliers have traded center Chris Andersen to the Charlotte Hornets. With the free roster spot, is there another move pending? The Cleveland Cavaliers hardly knew ye when it came to Chris Andersen. According to numerous reports, Andersen has been traded to the Charlotte Hornets in exchange for a protected second-round pick this season. They will also receive cash in the deal. This a move that will help clear salary off the luxury tax for the Cavaliers. The Cavs still have the highest salary cap in the NBA at $127 million. With the trade of Anderson and his $1.5 million contract, it drops the total to around $125 million. It’s not much, but any relief will do at this point. Cavs have traded Chris Andersen to Charlotte. Move clears a roster spot to add additional players. Cavs sent cash in deal as well. More importantly, the move opens up a roster spot for the Cavs to sign another player. They signed forward Derrick Williams last Thursday and he will likely be signed for the rest of the season once his 10-day contract expires. He’s averaged 9.5 points in two games. The Cavs are still in need of a point guard and center, and the open spot will be filled with one of those. There is still a chance they sign Mario Chalmers or Jordan Farmar after the showcase a few weeks ago, or they could look elsewhere. There are also rumors from the agent of former NBA center Larry Sanders that he’s looking to return to the league, per Gery Woelfel of the Racine (Wis.) Journal-Times. If this holds true, the Cavs are in need of a interior defensive presence, and that’s what Sanders specialized in when he was with the Milwaukee Bucks. Before Andersen tore his right ACL, he was going to be that defensive interior presence the Cavs needed. He was only averaging 9.5 minutes per game, but he gave opposing offenses a different look. Andersen was also able to give Tristan Thompson and Kevin Love a break as the backup center/forward. He didn’t impact the team, or even show Cavs fans the mid-range shot he worked on with the Memphis Grizzlies last season, but the intensity and championship experience he brought with him will be missed. It will be interesting to see what the Cavs next move is.